"네, 이게 런던이에요. 걱정하지 말아요. 런던이 이렇게 안개에 숨어있는 날은 겨울철 며칠뿐이에요." 체코의 유명 일러스트레이터 미로슬라프 샤셰크가 2004년 발간한 동화책 '이것이 런던입니다(This is London)'의 첫 페이지는 황갈색으로 메워진 채 시작한다. 안개가 자욱하게 낀 스모그의 도시 런던을 형상화한 것이다. 지난달 영국 남부 항구도시 브라이턴에서 만난 존 베넷(56)씨는 샤셰크의 책 첫 장을 보여주며 어린 시절 봤던 런던을 회상했다. 그의 아버지는 1950년대까지 런던에서 거주하다 60년대 브라이턴으로 이주했다. 새로운 일자리를 찾기 위해서이기도 했지만, 런던의 공기가 참을 수 없이 혼탁해진 것도 그가 이주하게 된 이유 중 하나였다. 베넷씨는 "아버지를 따라 어릴 적 런던에 간 적이 몇 번 있었는데, 그 당시 런던에서 쾌청한 날씨를 만나기란 매우 어려웠다"며 "젊은 세대들이 예전보다 맑아진 공기를 누리고 있어 다행"이라고 말했다. 영국에는 베넷씨 가족과 같은 경험이 있는 사람들을 쉽게 찾을 수 있다. 영국의 젊은 세대들도 할아버지·할머니 세대에 일어난 '런던스모그' 이야기를 듣고 자랐다. 런던 하늘의 어제와 오늘 1952년 12월 스모그로 시야가 확보되지 않는 런던 거리에서 교통정리 담당자가 손전등을 들고 버스가 갈 길을 밝히고 있다(왼쪽). 런던 시민들이 지난달 7일 중심가인 스트랜드 거리를 활보하고 있다. 런던스모그는 1952년 12월4∼8일 런던지역에 이어진 극심한 스모그다. 런던의 가정과 인근 공장에서 내뿜은 매연과 이산화황가스 등이 겨울철 차가운 공기와 합쳐져 도시에 내려앉아 정체되면서 나타난 현상이었다. 당시 런던의 평균 시계는 3∼5㎞였지만 런던스모그 사태가 발생한 5일 동안은 짙은 안개로 버스와 열차 교통사고가 빈발했다. 악화된 대기질로 응급실에는 심장발작이나 호흡곤란을 호소하는 환자들로 넘쳐났다. 영국 보건환경국은 5일간의 스모그로 당시 4000여명의 주민이 사망했다고 밝혔다. 런던스모그가 일어난 지 65년의 시간이 흐른 지금 런던의 대기질은 크게 개선됐다. 런던 중심에 위치한 트래펄가 광장과 광장에서 이어진 스트랜드 거리는 지난달 방문 당시 매우 쾌청한 상태를 보이고 있었다. 미세먼지 농도도 23㎍/㎥에 불과해 국내 기준으로 '좋음' 수준을 보였다. 이런 변화의 중심에는 영국 정부가 1956년 만든 '대기청정법'(Clean Air Act)이 자리하고 있다. 올해로 60주년을 맞은 이 법은 공장, 기차 등 공공시설에서부터 일반 가정에서 때는 석탄연료까지 규제하는 내용을 담고 있다. 지방자치단체에서는 매연감독관(Smoke Inspector)을 임명해 과도한 매연을 내뿜은 공장이나 가정을 규제해 벌금을 물리기도 했다. 영국 정부는 이에 그치지 않고 주된 환경오염 원인의 변화에 발맞춰 법을 순차적으로 개정하고 적용 대상을 확장해 나갔다. 1968년 법 적용 대상을 확장한 데 이어 1993년에는 미세먼지, 탄화수소, 다이옥신 등 새로운 오염물질도 규제대상에 포함했다. 영국 정부는 대기청정법에서 나아가 2020년에는 대기오염이 심각한 5개 도시에 '대기청정구역'(Clean Air Zone)을 설치할 예정이다. 5개 도시는 리즈 버밍햄 노팅엄 더비 사우샘프턴이다. 이 지역에서는 오염물질을 많이 배출하는 노후 버스 등 교통수단을 운행할 수 없다. 개인 차량은 제외된다. 런던 시민들이 지난달 7일 중심가인 스트랜드 거리를 활보하고 있다. 이 같은 노력에 의해 오늘날의 런던을 비롯한 영국의 잉글랜드 지역은 연평균 미세먼지 분포도가 세계보건기구(WHO) 권장기준인 10㎍/㎥에 가까운 수준으로 개선됐다. 법이 만들어진 60년 전에 비해 런던의 대기중 아황산가스 밀도는 300분의 1수준으로 낮아졌다. 영국은 여기서 그치지 않고 대기청정법 60주년을 맞아 왕립외과협회(Royal College ofPhysician)를 중심으로 '실내 대기오염'에 대한 연구에도 박차를 가하고 있다. 연구를 맞은 스티븐 홀게이트 RCP 석좌교수는 "대기청정법을 만든 후 60년간 대기오염이 인체에 미치는 영향을 추적연구했다"고 밝히며 "대기오염은 체내에 축적되는 방식이라 한번 오염물질을 흡입하면 이 물질이 지속적으로 건강에 영향을 미친다"고 말했다. 또 기술 발달에 따라 대기오염의 방식이 달라지고 있어 그 시대에 맞는 오염방지 방안을 만드는 게 중요하다고 조언했다. 이런 노력에도 영국 시민들은 정부가 대기질 개선에 더 많은 노력을 쏟아붓길 기대하고 있다. 최근에는 과거 대기오염에 따른 만성질환으로 사망한 런던 시민이 수천명에 달한다는 연구 결과도 발표돼, 이에 대해 정부가 책임져야 한다는 주장도 제기되고 있다. 런던 해크니 지역에 위치한 공익법률시민단체 '클라이언트어스'(ClientEarth)는 3년 전 정부를 상대로 낸 소송에서 승소한 뒤 올해부터 2차 소송을 진행하고 있다. 1차 소송에서 패소한 정부가 법원이 제시한 개선안에 따라 대기오염을 줄여나가야 했지만, 이를 이행하지 못해 2차 소송을 진행하고 있다는 게 이들의 설명이다. 지난달 사무소에서 만난 클라이언트어스의 활동가 안드리아 리(43·여)는 "정부가 독일 자동차 회사 폴크스바겐이 연비를 조작한 사건이 불거져 이 때문에 개선안을 이행하지 못했다고 주장하고 있다"며 "깨끗한 공기를 위해 계속 정부를 법률로써 압박하는 것도 하나의 방안"이라고 설명했다. 영국 학계에서는 관련 연구도 계속되고 있다. RCP의 홀게이트 교수는 "대기오염을 방지하는 방법은 단순히 오염물질을 규제하는 데 그치지 않고, 일반 시민들의 체력 증진도 함께 고려해야 한다"며 런던에서 일고 있는 자전거 타기 운동을 소개하기도 했다. 의사이기도 한 그는 "자동차를 타고 다니면서 살이 쪘다고 불평하기보다 걷고, 자전거를 타면서 환경을 지키는 방법을 생각해야 합니다"고 덧붙였다. ◆ "대기오염 한 번 노출돼도 만성질환 겪어"
"한번 대기오염에 노출되면 이는 그 사람의 평생에 영향을 미칩니다. 공기가 맑은 곳으로 이주해도 소용이 없죠." 지난달 영국 런던 왕립외과협회(Royal College of Physician)에서 만난 스티븐 홀게이트(Stephen Holgate·아래 사진) 석좌교수는 지난 2월 자신이 발표한 논문 '매일 우리가 쉬는 숨: 대기오염의 생애주기 영향(Every breath we take: the lifelong impact of airpolution)'을 보여주며 이같이 말했다. 홀게이트 교수는 영국 정부의 '대기청정법'이 시작된 지 60주년을 맞는 올해를 위해 2년여간 이번 논문을 준비했다. 60년 전 런던스모그를 비롯한 오염된 공기 속에서 살던 사람들과 반대로 깨끗한 환경에서 살던 사람들을 추적조사했다. 그 결과 한번 대기오염으로 피해를 본 신체는 깨끗한 공기가 있는 지역에 가더라도 쉽게 나아지지 않는 만성적 질환을 겪게 된다는 결론을 얻었다. 이런 연구 결과 때문에 홀게이트 교수는 "대기오염 방지 방안을 좀 더 실생활에 밀접한 분야를 통해 해결할 필요가 있다"고 주장했다. 이와 함께 그는 외부의 대기오염에 비해 실내 대기오염의 심각성이 크게 부각되지 않는 점을 염려했다. 그는 대기오염 문제를 해결하기 위해 △장기적 대책 수립 △전문가와 일반인에 대한 교육 강화 △차량용 친환경 대체연료 개발 △오염발생자에 책임부과 △대기환경 감시시스템 도입 △대기오염 악화 시 시민보호 대책 마련 △불공평 해소 △노약자 보호 등 총 14가지 권고사항을 논문을 통해 밝혔다. 그는 대기오염이 3단계로 나뉜다고 설명했다. 1단계는 '공장굴뚝'으로 대표되는 산업혁명에 따른 대기오염, 2단계는 '자동차 배기구'로 상징되는 자동차 수 증가에 따른 대기오염이다. 최근 3단계인 '실내 대기오염'이 새로운 연구과제로 떠올랐다. 홀게이트 교수는 "헤어스프레이는 물론, 음식을 할 때 나오는 탄소가스 등도 건강을 해치는 요인 중 하나"라고 했다. 그는 "사실 자동차 배기가스만 하더라도 바로 앞의 차량에서 뒤에 차량으로 들어오는 무색 무취의 공기가 가장 위험하다. 하지만 사람들은 이런 위험성을 간과하고 있다"며 밀폐된 공간에서의 대기오염에도 주목해야 하는 이유를 설명했다. 1980년대 초를 시작으로 한국을 수차례 방문한 그는 "한국의 전통가옥이 실내 대기오염을 방지하는 데 가장 적합한 구조를 띠고 있다"며 "각각 분리된 공간을 두고 있는 데다가 문을 열면 환기하기 좋은 구조이기 때문에 이상적"이라고 설명했다. 북극의 찬 소용돌이 바람이 올겨울 중위도 지역을 덮칠 것으로 보인다. 미국 언론들은 이르면 15일(현지시간)부터 이례적인 한파가 닥치고, 중서부 지역 기온이 20년 새 최저 기록을 경신할 것이라고 보도했다. 찬 바람을 북극권에 묶어두던 제트기류가 약해지면서 찬 바람이 북미와 러시아 시베리아, 동북아시아와 북유럽을 덮칠 것으로 예상된다. 지난 11일부터 미국 아이오와, 일리노이, 인디애나 등 몇몇 주에서는 20㎝ 넘는 눈이 쌓였다. NBC 등은 미 중서부 주들과 캐나다 국경에 걸쳐진 5대호 일대에 강추위가 예상된다고 보도했다. 오하이오의 경우 평년 기온보다 25도나 낮다. 캐나다 언론들도 올겨울 이례적인 한파를 예보했다. 미국에서는 2014년 1월 북극 찬 바람이 밀려내려와 한파가 몰아닥쳤다. 기상학자들은 당시와 지금의 기상 상황이 비슷하며, 중위도 지역의 평균기온이 20년 새 최저치로 떨어질 수도 있다고 경고했다. 중위도 지역의 이례적인 한파는 북극진동이 교란됐기 때문이다. 북극진동은 북극의 찬 소용돌이 바람이 강약을 되풀이하는 현상을 말한다. 북극진동 자체는 이상 현상이 아니다. 지구가 열대지방에서 남아도는 열을 북극으로 옮기려는 에너지 순환작용의 일부다. 문제는 찬 바람을 가둬두는 제트기류가 기후변화로 붕괴하면서 북극진동의 패턴이 달라지고 북극의 찬 바람이 더 남쪽으로 내려오게 되는 것이다. 북극의 찬 공기는 고기압이고 중위도의 따뜻한 공기는 저기압이어서 극지방을 감싸는 제트기류가 생긴다. 그런데 북극이 따뜻해져 중위도 지역과의 온도 차이가 줄어들면 제트기류가 약해진다. 지난달 북극 평균기온이 평년보다 20도나 올라가는 등 올해 북극은 기록적으로 높은 기온을 보이고 있다. 몇몇 지역에서는 더운 바람이 밀고 올라가고 또 다른 지역에서는 찬 바람이 남쪽으로 내려오는데, 현재는 북극진동이 2개로 조각나다시피 했다. 밀려내려온 북극권의 찬 공기 중 한 덩어리는 러시아 쪽, 한 덩어리는 북미 대륙을 덮고 있다. 기상학자들은 올겨울 북극의 찬 바람이 더 자주, 더 남쪽으로 내려올 것이며 고위도와 중위도의 접경선인 북미와 동북아시아 일대가 영향권에 들어갈 것으로 봤다. polar vortex 에 대한 연구가 더욱 필요한 듯 .. In order to stop global warming all we really have to do is to stabilise CO2 emissions, not reduce them to zero! One of the 'myths' promoted by IPCC climate scientists is that we have to stop burning any fossil fuels i.e. we must 'keep it in the ground'. This is a total fallacy as I will try to explain in this post. The origin of this belief that we must stop burning all fossil fuels by ~2050 can be traced back to Figure 10 which appeared in the AR5 'Summary for Policy Makers'. Here it is. Figure 10 was intended to send a simple message to the world's political leaders. Namely that there is a finite total amount of fossil fuel that mankind can safely burn, and that we have already burned half of it. 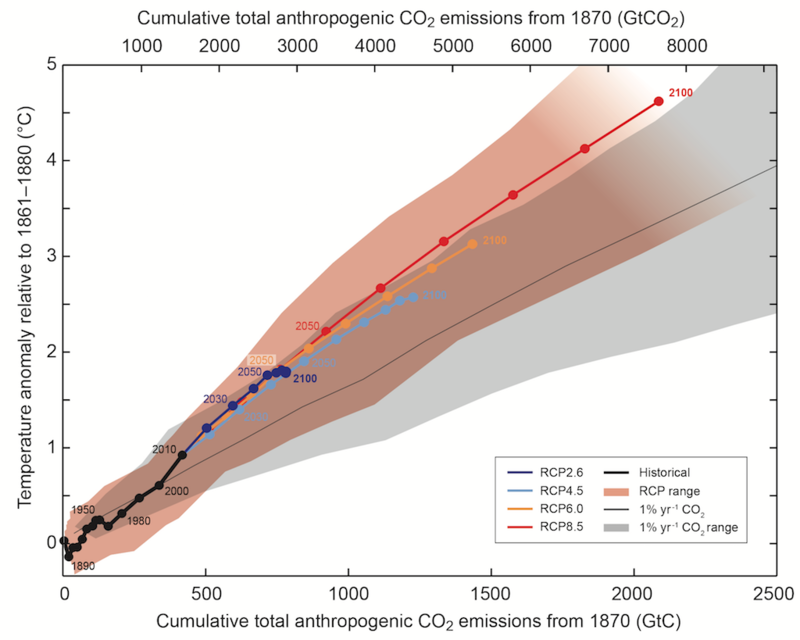 Therefore unless the major industrialised countries stop burning fossil fuels altogether by 2050, the world will warm far above 2C (red curve) causing a global disaster. This message worked, but there is so much wrong about the hidden assumptions and even subterfuge used to produce Figure 10 that I wrote a post about it at the time. 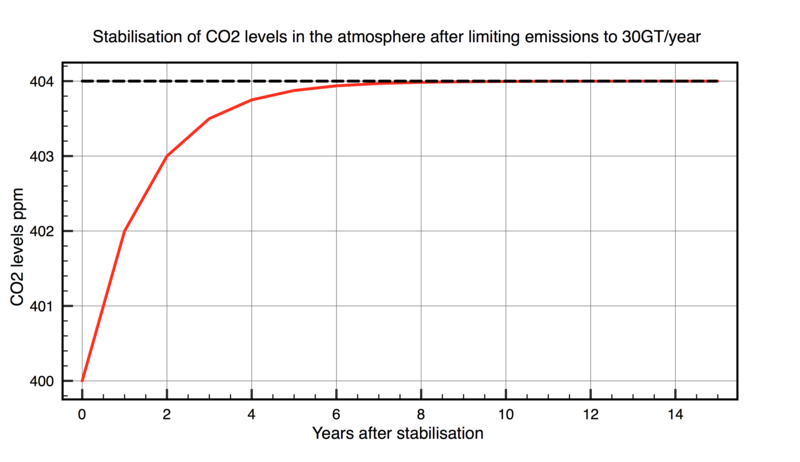 Replacement of logarithmic forcing of CO2 with a linear forcing. As a direct consequence of IPCC successful lobbying based around Figure 10, the Paris treaty now proudly "sets the world on an irreversible trajectory on which all investment, all regulation and all industrial strategy must start to align with a zero carbon global economy". Does anyone really believe that this is even feasible, let alone realistic? It simply is not going to happen because well before then their citizens will revolt and kick them out. The best we can hope for in the short term is a stabilisation in the annual global CO2 emissions. I argue that by simply stabilising emissions, we can halt global warming. Clearly the lower total 'stable' emissions are then the cooler the planet will be, but even if we only managed to stabilise emissions at current values the net warming will still be <2C and CO2 levels will stop rising and stabilise at <410 ppm. Atmospheric CO2 levels must always reach an equilibrium as the natural carbon sinks will catch up to balance emissions. For the last 40 years about half of man-made emissions have been absorbed mainly into the oceans, but also into soils and biota. The reason why CO2 levels have been continuously increasing since 1970 is that we have been increasing emissions each year, so the sinks have never been able to catch up. Sinks will quickly balance emissions and CO2 levels will stop rising once emissions stop increasing. This fact is obvious because run-away CO2 levels have never happened in the earth's long history. Such a balancing mechanism has always stabilised atmospheric CO2 over billions of years during intense periods of extreme volcanic activity, ocean spreading and periodic tectonic mountain building. Fossil fuels are an insignificant fraction when compared to the buried carbon contained in sedimentary rocks. To see how this works let's assume that the world can stabilise annual emissions at current rates of 34 Gtons CO2/year indefinitely. We know that CO2 sinks currently absorb half of that figure – 17 Gtons and have been increasing proportional to the increase in partial pressure of CO2 in the atmosphere – currently 400ppm. Stabilising emissions would result in the increasing fractional uptake by carbon sinks of the now fixed emissions. 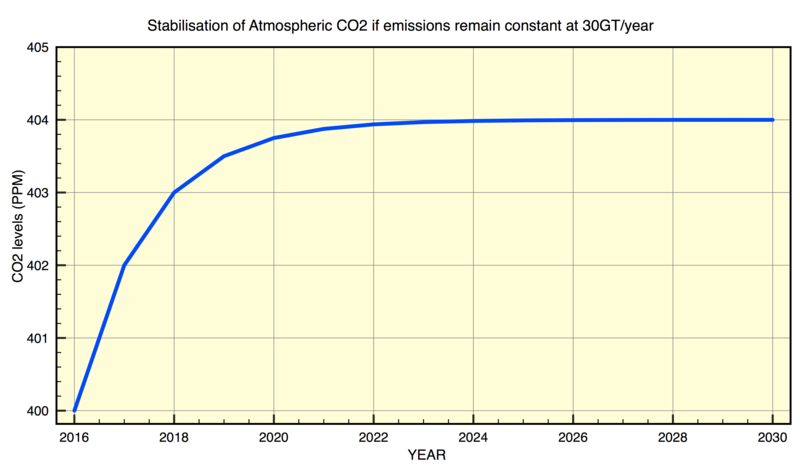 The remaining fraction of annual emissions that would remain in the atmosphere is therefore as follows. So CO2 levels in the atmosphere will taper off after just ~10 years to reach a new long term value equivalent to adding an additional 34 Gtons of CO2 to the atmosphere. The atmosphere currently contains 3.13 x 10^12 tons of CO2 so the net increase at equilibrium would be only an extra 1%. Therefore for the years following 2016 the resultant CO2 curve looks like this. There is also a very good chance that we can achieve such a fixed limit, rather than pretend to meet an impossible target of zero emissions. However this does mean that CO2 levels will remain at 404 ppm indefinitely, which is far higher than a planet without human beings, but still leaves us plenty of time to replace fossil fuels, with new nuclear energy. Controlling CO2 levels by stabilising emissions also has one huge advantage. It means that we can eventually control the level of 'enhanced global warming' so avoiding another devastating ice age, otherwise due to begin within 5000 years time. .. 정말로 CO2 농도가 평형 상태에 도달하고 유지 할 수 있을지는 ...의심 ..